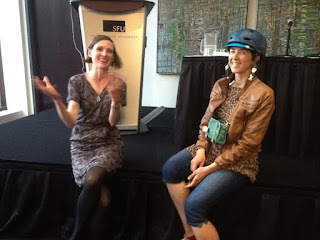 Spokesmama: Recap--Cycling at the Crossroads: Advocacy, Policy and Tools for Change from London, U.K.
Recap--Cycling at the Crossroads: Advocacy, Policy and Tools for Change from London, U.K.
Last night I attended a free lecture at SFU Harbour Centre: Cycling at the Crossroads: Advocacy, Policy and Tools for Change from London, U.K. There were two speakers, both fascinating in very different ways, & I came home with a lot to think about. James Woodcock, lead investigator for the Propensity to Cycle Tool who also leads the Public Health Modelling Group in CEDAR at the University of Cambridge, spoke about the soon to be available, open source Propensity to Cycle Tool. It essentially combines data on where people live, where they travel to, how they get there, & how hilly the areas are. The data produces heat maps of places where people would be likely to ride & can even filter results based on targeting areas for the highest greenhouse gas reductions, or the most impact on public health. It could be a really powerful tool to help city & transportation planners decide where to build new cycling infrastructure. I hope the City of Vancouver can start using a similar system--I love that the creators of this tool have kept it open source to share knowledge internationally. Rachel Aldred, a senior lecturer in transport at the University of Westminster, talked about what London has been doing to improve cycling in the past few years & what challenges remain to overcome. She had a great analysis of the two main schools of thought when it comes to viewing cycling risk. The first is one very familiar to those of us in North America: individualization, which emphasizes cycling as a personal choice, frames cycling as dangerous rather than drivers or roads, focusses on individual solutions like wearing safety gear & taking training, & good ol' victim blaming. The second model is the socialization of cycling risk, which sees cycling as a public service or part of the transportation system, blames road design &/or drivers for causing danger, focusses on collective solutions like infrastructure as well as legal & policy changes, plus holding politicians to account. A place like Amsterdam is a good example of the second model--cycling is seen as something normal, safe, & easy that needs to be provided for via infrastructure improvements, laws that assign the burden of liability to drivers. In terms of political accountability, Amsterdam has recently set the bar very high: they have created the position of cycling mayor for their city. The City of Vancouver has made great strides over the past few years to shift toward a socialization of risk when it comes to cycling, but there is still a long way to go to change the culture here. Having cycled in Amsterdam & seen how far we have to go here can definitely feel overwhelming at times. However, going to events like this is really energizing for me, partly because of the discussion, but also because of the connections I often make there. 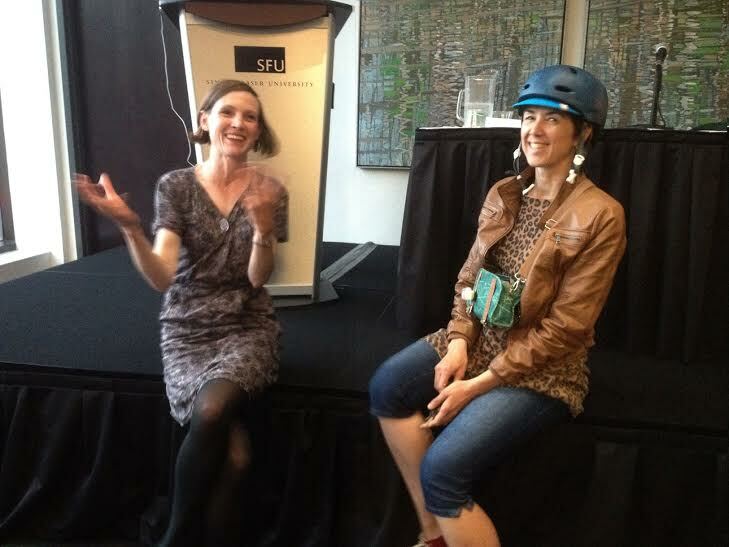 After this talk I met a researcher at UBC who is studying mothers who commute by bike. I can't wait to hear more about her work.